All transactions are safe and secure with a reliable history in online purchasing behind each of our associates. 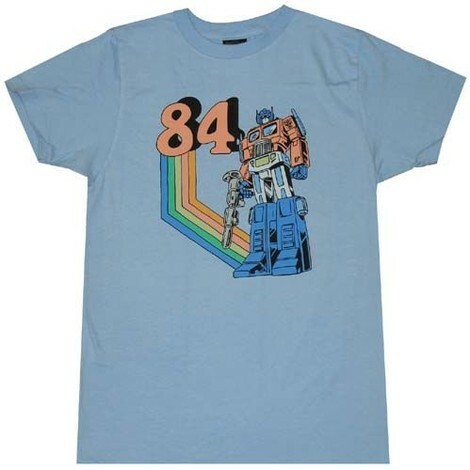 Buy the 1984 Optimus Prime t-shirts to own Transformers clothing and merchandise. This officially licensed light blue T celebrates the year that we were officially introduced to the Autobots and Optimus Prime. In 1984, Hasbro's Transformers made their way from their home planet of Cybertron into toy boxes across America. The unique toys offered a two dimensional play value. Celebrate with these '84 Optimus Prime t-shirts. In addition to the 1984 Optimus Prime tees above, browse the Transformers Clothing Gallery for more apparel like men's and women's clothes, kids shirts or hoodies.